1 x TV Shield 8oz Cleaner/Polish Combo Kit with Polishing & Cleaning Pad. Please not we currently do not supply the mount/bracket. Any good electrical retailer will be able to help you with your purchase. The Display Shield is compatible with any VESA type mount/bracket. Please be mindful of the weight capacity as the bracket will need to hold the weight of the Shield and the television/digital display. 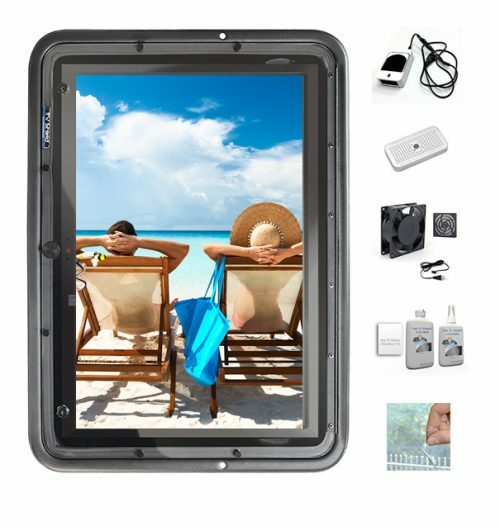 The TV Shield is versatile product that can be used to protect your TV’s and LCD Screens in a variety of places and environments. Just use your imagination a bit and you’ll see that The TV Shield is the Ultimate in Indoor and Outdoor TV Protection.